1. An all-new S Pen – with Bluetooth! Now the S Pen can do even more – with Bluetooth capabilities, you can use it as a remote control for your presentations, or even use it to capture photos like never before. The possibilities are endless for you and your team to bring it to life. You can easily connect the Samsung Galaxy Note9 to a monitor, keyboard and mouse with a single HDMI dongle using Samsung DeX. This allows you to work from anywhere in a larger format. You can also multi-task and use the phone screen while powering the desktop experience simultaneously. Take notes, watch videos, edit presentations… all at once! Getting caught off-guard and losing battery halfway through the day can be frustrating – that’s why the Samsung Galaxy Note9 has a new and improved battery that lasts all day, while keeping up with your always-on lifestyle, so that you can keep going, with your device. Plus, with wireless fast-charge technology, the battery recharges extra quickly to maximise your mobility throughout the day and get more done. (Available when you buy the compatible wireless charging pad separately). The new 6.4”* Infinity Display for the Samsung Galaxy Note9 is the device’s largest yet! (*measured diagonally as a full rectangle without accounting for rounded edges). The large, brilliant screen makes your experience more immersive than ever, whether you’re watching videos or editing documents. 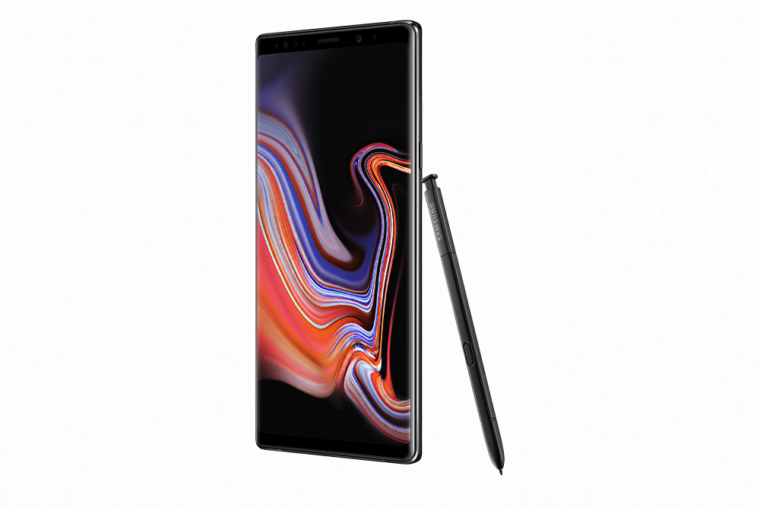 The Samsung Galaxy Note9’s cutting edge 10nm AP processor works super-fast, allowing you and your team to work at their best with the device. The 10nm chipset offers better performance and lower power consumption compared to the previous generations of chipsets generally. The Dual Aperture lens adapts to the surrounding light like the human eye. F1.5 mode takes great lowlight shot, while F2.4 mode helps make sure that your photos come out crystal clear. Plus, with 2x optical zoom you’ll get lots of detail for your close-up shots. Camera capture optimisation and instant flaw detection also make it almost impossible to take a bad photo with this device! The Samsung Galaxy Note9 comes in two main colours (Ocean Blue and Midnight Black) and is available to order now with Vodafone. Don’t miss out!